This is “Moore’s Law and More: Fast, Cheap Computing and What It Means for the Manager”, chapter 4 from the book Getting the Most Out of Information Systems: A Manager's Guide (v. 1.0). For details on it (including licensing), click here. 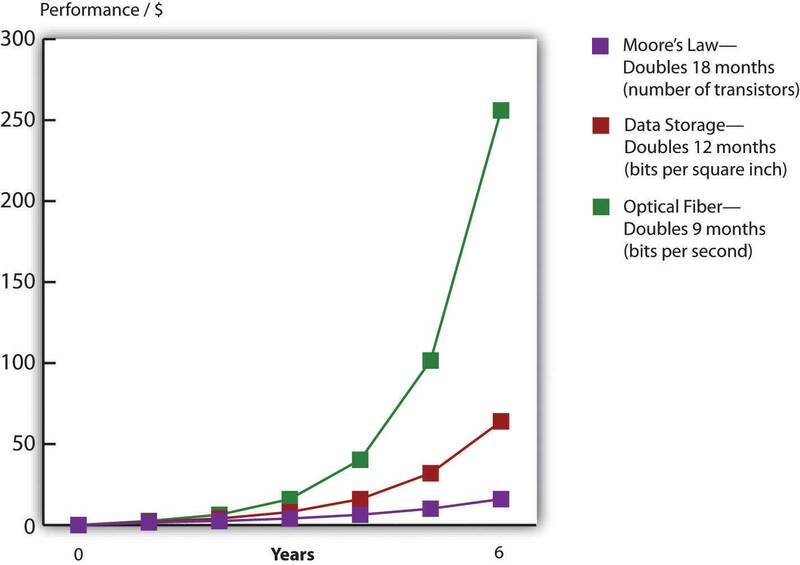 Define Moore’s Law and understand the approximate rate of advancement for other technologies, including magnetic storage (disk drives) and telecommunications (fiber-optic transmission). Understand how the price elasticity associated with faster and cheaper technologies opens new markets, creates new opportunities for firms and society, and can catalyze industry disruption. Recognize and define various terms for measuring data capacity. Consider the managerial implication of faster and cheaper computing on areas such as strategic planning, inventory, and accounting. Faster and cheaper—those two words have driven the computer industry for decades, and the rest of the economy has been along for the ride. Today it’s tough to imagine a single industry not impacted by more powerful, less expensive computing. Faster and cheaper puts mobile phones in the hands of peasant farmers, puts a free video game in your Happy Meal, and drives the drug discovery that may very well extend your life. This phenomenon of “faster, cheaper” computing is often referred to as Moore’s LawChip performance per dollar doubles every eighteen months., after Intel cofounder, Gordon Moore. Moore didn’t show up one day, stance wide, hands on hips, and declare “behold my law,” but he did write a four-page paper for Electronics Magazine in which he described how the process of chip making enabled more powerful chips to be manufactured at cheaper prices.G. Moore, “Cramming More Components onto Integrated Circuits,” Electronics Magazine, April 19, 1965. Moore’s friend, legendary chip entrepreneur and CalTech professor, Carver Mead, later coined the “Moore’s Law” moniker. That name sounded snappy, plus as one of the founders of Intel, Moore had enough geek cred for the name to stick. Moore’s original paper offered language only a chip designer would love, so we’ll rely on the more popular definition: chip performance per dollar doubles every eighteen months (Moore’s original paper assumed two years, but many sources today refer to the eighteen-month figure, so we’ll stick with that). Moore’s Law applies to chips—broadly speaking, to processors, or the electronics stuff that’s made out of silicon.Although other materials besides silicon are increasingly being used. The microprocessorThe part of the computer that executes the instructions of a computer program. is the brain of a computing device. It’s the part of the computer that executes the instructions of a computer program, allowing it to run a Web browser, word processor, video game, or virus. For processors, Moore’s Law means that next generation chips should be twice as fast in eighteen months, but cost the same as today’s models (or from another perspective, in a year and a half, chips that are same speed as today’s models should be available for half the price). Random-access memory (RAM)The fast, chip-based volatile storage in a computing device. is chip-based memory. The RAM inside your personal computer is volatile memoryStorage (such as RAM chips) that is wiped clean when power is cut off from a device., meaning that when the power goes out, all is lost that wasn’t saved to nonvolatile deviceStorage that retains data even when powered down (such as flash memory, hard disk, or DVD storage). (i.e., a more permanent storage media like a hard disk or flash memory). Think of RAM as temporary storage that provides fast access for executing computer programs and files. When you “load” or “launch” a program, it usually moves from your hard drive to those RAM chips, where it can be more quickly executed by the processor. Cameras, MP3 players, USB drives, and mobile phones often use flash memoryNonvolatile, chip-based storage, often used in mobile phones, cameras, and MP3 players. Sometimes called flash RAM, flash memory is slower than conventional RAM, but holds its charge even when the power goes out. (sometimes called flash RAM). It’s not as fast as the RAM used in most traditional PCs, but holds data even when the power is off (so flash memory is also nonvolatile memory). You can think of flash memory as the chip-based equivalent of a hard drive. In fact, flash memory prices are falling so rapidly that several manufactures including Apple and the One Laptop per Child initiative (see the “Tech for the Poor” sidebar later in this section) have begun offering chip-based, nonvolatile memory as an alternative to laptop hard drives. The big advantage? Chips are solid state electronicsSemiconductor-based devices. Solid state components often suffer fewer failures and require less energy than mechanical counterparts because they have no moving parts. RAM, flash memory and microprocessors are solid state devices. Hard drives are not. (meaning no moving parts), so they’re less likely to fail, and they draw less power. The solid state advantage also means that chip-based MP3 players like the iPod nano make better jogging companions than hard drive players, which can skip if jostled. For RAM chips and flash memory, Moore’s Law means that in eighteen months you’ll pay the same price as today for twice as much storage. Source: Adopted from Shareholder Presentation by Jeff Bezos, Amazon.com, 2006. Computer chips are sometimes also referred to as semiconductorsA substance such as silicon dioxide used inside most computer chips that is capable of enabling as well as inhibiting the flow of electricity. From a managerial perspective, when someone refers to semiconductors, they are talking about computer chips, and the semiconductor industry is the chip business. (a substance such as silicon dioxide used inside most computer chips that is capable of enabling as well as inhibiting the flow of electricity). So if someone refers to the semiconductor industry, they’re talking about the chip business.Semiconductor materials, like the silicon dioxide used inside most computer chips, are capable of enabling as well as inhibiting the flow of electricity. These properties enable chips to perform math or store data. Strictly speaking, Moore’s Law does not apply to other technology components. But other computing components are also seeing their price versus performance curves skyrocket exponentially. Data storage doubles every twelve months. Networking speed is on a tear, too. With an equipment change at the ends of the cables, the amount of data that can be squirt over an optical fiber lineA high-speed glass or plastic-lined networking cable used in telecommunications. can double every nine months.Fiber-optic lines are glass or plastic data transmission cables that carry light. These cables offer higher transmission speeds over longer distances than copper cables that transmit electricity. Faster and cheaper makes possible the once impossible. As a manager, your job will be about predicting the future. First, consider how the economics of Moore’s Law opens new markets. When technology gets cheap, price elasticityThe rate at which the demand for a product or service fluctuates with price change. Goods and services that are highly price elastic (e.g., most consumer electronics) see demand spike as prices drop, whereas goods and services that are less price elastic are less responsive to price change (think heart surgery). kicks in. Tech products are highly price elastic, meaning consumers buy more products as they become cheaper.As opposed to goods and services that are price inelastic (like health care and housing), which consumers will try their best to buy even if prices go up. And it’s not just that existing customers load up on more tech; entire new markets open up as firms find new uses for these new chips. Just look at the five waves of computing we’ve seen over the previous five decades.Michael Copeland, “How to Ride the Fifth Wave,” Business 2.0, July 1, 2005. In the first wave in the 1960s, computing was limited to large, room-sized mainframe computers that only governments and big corporations could afford. Moore’s Law kicked in during the 1970s for the second wave, and minicomputers were a hit. These were refrigerator-sized computers that were as speedy as or speedier than the prior generation of mainframes, yet were affordable by work groups, factories, and smaller organizations. The 1980s brought wave three in the form of PCs, and by the end of the decade nearly every white-collar worker in America had a fast and cheap computer on their desk. In the 1990s wave four came in the form of Internet computing—cheap servers and networks made it possible to scatter data around the world, and with more power, personal computers displayed graphical interfaces that replaced complex commands with easy-to-understand menus accessible by a mouse click. At the close of the last century, the majority of the population in many developed countries had home PCs, as did most libraries and schools. Now we’re in wave five, where computers are so fast and so inexpensive that they have become ubiquitous—woven into products in ways few imagined years before. Silicon is everywhere! It’s in the throwaway RFID tags that track your luggage at the airport. It provides the smarts in the world’s billion-plus mobile phones. It’s the brains inside robot vacuum cleaners, next generation Legos, and the table lamps that change color when the stock market moves up or down. These digital shifts can rearrange entire industries. Consider that today the firm that sells more cameras than any other is Nokia, a firm that offers increasingly sophisticated chip-based digital cameras as a giveaway as part of its primary product, mobile phones. This shift has occurred with such sweeping impact that former photography giants Pentax, Konica, and Minolta have all exited the camera business. Carl Yankowski almost never gets caught in the rain without his umbrella. That’s because Yankowski’s umbrella regularly and wirelessly checks weather reports on its own. If the umbrella gets word it will rain in the next few hours, the handle blinks with increasing urgency, warning its owner with a signal that seems to declare “you will soon require my services.” Yankowski is CEO of “fifth wave” firm Ambient Devices, a Massachusetts startup that’s embedding computing and communications technology into everyday devices in an attempt to make them “smarter” and more useful. Ambient’s ability to pull off this little miracle is evidence of how quickly innovative thinkers are able to take advantage of new opportunities and pioneer new markets on the back of Moore’s Law. The firm’s first product, the Orb, is a lamp that can be set up to change color in real time in reaction to factors such as the performance of your stock portfolio or the intensity of the local pollen count. In just six months, the ten refugees from MIT’s Media Lab that founded Ambient Devices took the idea for the Orb, designed the device and its software, licensed wireless spectrum from a pager firm that had both excess capacity and a footprint to cover over 90 percent of the United States, arranged for manufacturing, and began selling the gizmo through Brookstone and Nieman Marcus.Michael Copeland, “How to Ride the Fifth Wave,” Business 2.0, July 1, 2005; and J. Miller, “Goodbye G.U.I? Ambient Orb a Computer ‘Mood Ring,’” Mass High Tech, February 10, 2003. Ambient has since expanded the product line to several low-cost appliances designed to provide information at a glance. These include the Ambient Umbrella, as well as useful little devices that grab and display data ranging from sports scores to fluctuating energy prices (so you’ll put off running the dishwasher until evening during a daytime price spike). The firm even partnered with LG on a refrigerator that can remind you of an upcoming anniversary as you reach for the milk. Products developed by “fifth wave” firm Ambient Devices include the weather-reading Ambient Umbrella, the Energy Joule, a seven-day forecaster, and the Orb lamp. Source: Used with permission from Ambient Devices. One of the most agile surfers of this fifth wave is Apple, Inc.—a firm with a product line that is now so broad that in January 2007, it dropped the word “Computer” from its name. Apple’s breakout resurgence owes a great deal to the iPod. At launch, the original iPod sported a 5 GB hard drive that Steve Jobs declared would “put 1,000 songs in your pocket.” Cost? $399. Less than six years later, Apple’s highest-capacity iPod sold for fifty dollars less than the original, yet held forty times the songs. By that time the firm had sold over one hundred fifty million iPods—an adoption rate faster than the original Sony Walkman. Apple has sold new, low-end iPods for less than fifty dollars a piece, and high-end models have morphed into Internet browsing devices capable of showing maps, playing videos, and gulping down songs from Starbucks wi-fi while waiting in line for a latte. The original iPod has also become the jumping off point for new business lines including the iPhone, Apple TV, and iTunes store. As an online store, iTunes is always open. iTunes regularly sells tens of millions of songs on Christmas Day alone, a date when virtually all of its U.S.-based competition is closed for the holiday. In a short five years after its introduction, iTunes has sold over four billion songs and has vaulted past retail giants Wal-Mart, Best Buy, and Target to become the number one music retailer in the United States. Today’s iTunes is a digital media powerhouse, selling movies, TV shows, games, and other applications. And with podcasting, Apple’s iTunes University even lets students at participating schools put their professors’ lectures on their gym playlist for free. Surfing the fifth wave has increased the value of Apple stock sixteenfold six years after the iPod’s launch. Ride these waves to riches, but miss the power and promise of Moore’s Law and you risk getting swept away in its riptide. Apple’s rise occurred while Sony, a firm once synonymous with portable music, sat on the sidelines unwilling to get on the surfboard. Sony’s stock stagnated, barely moving in six years. The firm has laid off thousands of workers while ceding leadership in digital music (and video) to Apple. Moore’s Law restructures industries. The firms that dominated music sales when you were born are now bankrupt, while one that had never sold a track now sells more than anyone else.Note: Twelve tracks are equivalent to one CD. While the change in hard drive prices isn’t directly part of Moore’s Law (hard drives are magnetic storage, not silicon chips), as noted earlier, the faster and cheaper phenomenon applies to storage, too. Look to Amazon as another example of jumping onto a once-impossible opportunity courtesy of the price/performance curve. When Amazon.com was founded in 1995, the largest corporate database was one terabyte or TB (see “Bits and Bytes” below) in size. In 2003, the firm offered its “Search Inside the Book” feature, digitizing the images and text from thousands of books in its catalog. “Search Inside the Book” lets customers peer into a book’s contents in a way that’s both faster and more accurate than browsing a physical bookstore. Most importantly for Amazon and its suppliers, titles featured in “Search Inside the Book” enjoyed a 7 percent sales increase over nonsearchable books. When “Search Inside the Book” launched, the database to support this effort was 20 TB in size. In just eight years, the firm found that it made good business sense to launch an effort that was a full twenty times larger than anything used by any firm less than a decade earlier. And of course, all of these capacities seem laughably small by today’s standards (see Chapter 11 "The Data Asset: Databases, Business Intelligence, and Competitive Advantage"). For Amazon, the impossible had not just become possible; it became good business. By 2009, digital books weren’t just for search; they were for sale. Amazon’s Kindle reader (a Moore’s Law marvel sporting a microprocessor and flash storage) became the firm’s top-selling product in terms of both unit sales and dollar volume. Computers express data as bits that are either one or zero. Eight bits form a byte (think of a byte as being a single character you can type from a keyboard). A kilobyte refers to roughly a thousand bytes, or a thousand characters, megabyte = 1 million, gigabyte = 1 billion, terabyte = 1 trillion, petabyte = 1 quadrillion, exabyte = 1 quintillion bytes. While storage is most often listed in bytes, telecommunication capacity (bandwidth) is often listed in bits per second (bps). The same prefixes apply (Kbps = kilobits, or one thousand bits, per second, Mbps = megabits per second, Gbps = gigabits per second, Tbps = terabits per second). These are managerial definitions, but technically, a kilobyte is 210 or 1,024 bytes. Mega = 220, tera = 230, giga = 240, peta = 250, and exa = 260. To get a sense for how much data we’re talking about, see Table 4.2 "Bytes Defined" below.E. Schuman, “At Wal-Mart, World’s Largest Retail Data Warehouse Gets Even Larger,” eWeek, October 13, 2004; and J. Huggins, “How Much Data Is That?” Refrigerator Door, August 19, 2008. Here’s another key implication—if you are producing products with a significant chip-based component, the chips inside that product rapidly fall in value. That’s great when it makes your product cheaper and opens up new markets for your firm, but it can be deadly if you overproduce and have excess inventory sitting on shelves for long periods of time. Dell claims its inventory depreciates as much as a single percentage point in value each week.Bill Breen, “Living in Dell Time,” Fast Company, November 24, 2004. That’s a big incentive to carry as little inventory as possible, and to unload it, fast! While the strategic side of tech may be the most glamorous, Moore’s Law impacts mundane management tasks, as well. From an accounting and budgeting perspective, as a manager you’ll need to consider a number of questions: How long will your computing equipment remain useful? If you keep upgrading computing and software, what does this mean for your capital expense budget? Your training budget? Your ability to make well-reasoned predictions regarding tech’s direction will be key to answering these questions. Nicholas Negroponte, the former head of MIT’s Media Lab, is on a mission. His OLPC (One Laptop per Child) project aims to create a one-hundred-dollar laptop for distribution to the world’s poor. A rubberized keyboard and entirely solid-state design (flash RAM rather than hard drive) help make the machine durable. The laptop’s ultrabright screen is readable in daylight and can be flipped to convert into an e-book reader. And a host of open source software and wiki tools for courseware development all aim to keep the costs low (the first generation of the product, called the XO, was priced around $175). Mesh networking allows laptops within a hundred feet or so to communicate with each other, relaying a single Internet connection for use by all. And since the XO is targeted at the world’s poorest kids in communities where power generation is unreliable or nonexistent, several battery-charging power generation schemes have been tested including a hand crank, pull chord, and foot pedal. 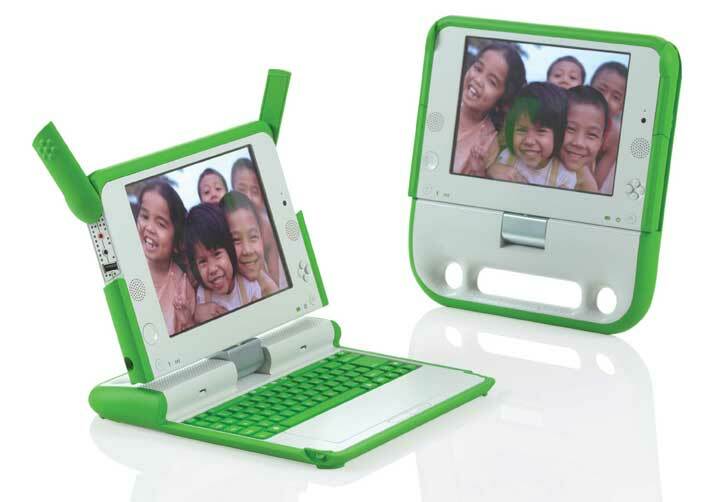 In its first two years, the OLPC foundation delivered 825,000 laptops to children in twenty-four countries.C. Lawton, “The X.O. Laptop Two Years Later,” Wired, June 19, 2009. The XO is a product made possible by the rapidly falling price of computing. While the success of the OLPC effort will reveal itself over time, another tech product containing a microprocessor is already transforming the lives of some of the world’s most desperate poor—the cell phone. There are three billion people worldwide that don’t yet have a phone, but they will, soon. In the ultimate play of Moore’s Law opening up new markets, mobiles from Vodafone and Indian telecom provider Spice sell for $25 or less. While it took roughly twenty years to sell a billion mobile phones worldwide, the second billion sold in four years, and the third billion took just two years. Today some 80 percent of the world’s population lives within cellular network range, double the 2000 level. Today the vast majority of mobile subscriptions are in developing countries.Sara Corbett, “Can the Cellphone Help End Global Poverty?” New York Times Magazine, April 13, 2008. Source: Used with permission from fuseproject. Why such demand? Mobiles change lives for the better. According to Columbia economist Jeffry Sachs, “The cell phone is the single most transformative technology for world economic development.”Jack Ewing, “Upwardly Mobile in Africa,” BusinessWeek, September 24, 2007, 64–71. Think about the farmer who can verify prices and locate buyers before harvesting and transporting perishable crops to market; the laborer who was mostly unemployed but with a mobile is now reachable by those who have day-to-day work; the mother who can find out if a doctor is in and has medicine before taking off work to make the costly trek to a remote clinic with her sick child; or the immigrant laborer serving as a housekeeper who was “more or less an indentured servant until she got a cell phone” enabling new customers to call and book her services.Sara Corbett, “Can the Cellphone Help End Global Poverty?” New York Times Magazine, April 13, 2008. As an example of impact, look to poor fishermen in the Indian state of Kerala. By using mobile phones to find the best local marketplace prices for sardines, these fishermen were able to increase their profits by an average of eight percent even though consumer prices for fish dropped 4 percent. The trends benefiting both buyer and seller occurred because the fishermen no longer had to throw away unsold catch previously lost by sailing into a port after all the buyers had left. A London Business School study found that for every ten mobile phones per one hundred people, a country’s GDP bumps up 0.5 percent.Jack Ewing, “Upwardly Mobile In Africa,” BusinessWeek, September 24, 2007, 64–71. Bangladeshi economist Mohammed Yunus won the Nobel Peace Prize based on his work in the microfinance movement, an effort that provides very small loans to the world’s poorest entrepreneurs. Microfinance loans grew the market for Grameen Phone Ltd., a firm that has empowered over two hundred and fifty thousand Bangladeshi “phone ladies” to start businesses that helped their communities become more productive. Phone ladies buy a phone and special antenna on microcredit for about $150 each. These special long-life battery phones allow them to become a sort of village operator, charging a small commission for sending and receiving calls. Through phone ladies, the power of the mobile reaches even those too poor to afford buying one outright. Grameen Phone now has annual revenues of over one billion dollars and is Bangladesh’s largest telecom provider. In another ingenious scheme, phone minutes become a proxy for currency. The New York Times reports that a person “working in Kampala, for instance, who wishes to send the equivalent of five dollars back to his mother in a village will buy a five-dollar prepaid airtime card, but rather than entering the code into his own phone, he will call the village phone operator and read the code to her. [The operator] then uses the airtime for her phone and completes the transaction by giving the man’s mother the money, minus a small commission.”Sara Corbett, “Can the Cellphone Help End Global Poverty?” New York Times Magazine, April 13, 2008. South Africa’s Wizzit and GCash in the Philippines allow customers to use mobile phones to store cash credits sent from another phone or purchased through a post office or kiosk operator. When phones can be used as currency for purchases or payments, who needs Visa? Vodafone’s Kenyan-based M-Pesa mobile banking program landed 200,000 new customers in a month—they’d expected it would take a year to hit that mark. With 1.6 million customers by that time, the service is spreading throughout Africa. The “mobile phone as bank” may bring banking to a billion unserved customers in a few years. Moore’s law applies to the semiconductor industry. Moore’s Law states that for the same money, roughly eighteen months from now you should be able to purchase computer chips that are twice as fast or store twice as much information. Or over that same time period chips with the speed or storage of today’s chips should cost half as much as they do now. Nonchip-based technology also advances rapidly. Disk drive storage doubles roughly every twelve months, while equipment to speed transmissions over fiber-optic lines has doubled every nine months. These trends influence inventory value, depreciation accounting, employee training, and other managerial functions. They also help improve productivity and keep interest rates low. From a strategic perspective, these trends suggest that what is impossible from a cost or performance perspective today may be possible in the future. This fact provides an opportunity to those who recognize and can capitalize on the capabilities of new technology. As technology advances, new industries, business models, and products are created, while established firms and ways of doing business can be destroyed. Managers must regularly study trends and trajectory in technology to recognize opportunity and avoid disruption. What is Moore’s Law? What does it apply to? Are other aspects of computing advancing as well? At what rates? What is a microprocessor? What devices do you or your family own that contain microprocessors (and hence are impacted by Moore’s Law)? What is a semiconductor? What is the substance from which most semiconductors are made? How do does flash memory differ from the memory in a PC? Are both solid state? Which of the following are solid state: an iPod shuffle, a TiVo DVR, a typical laptop PC? Why is Moore’s Law important for managers? How does it influence managerial thinking? What is price elasticity? How does Moore’s Law relate to this concept? What’s special about falling chip prices compared to price drops for products like clothing or food? Give examples of firms that have effectively leveraged the advancement of processing, storage, and networking technology. What are the five waves of computing? Give examples of firms and industries impacted by the fifth wave. As Moore’s Law advances, technology becomes increasingly accessible to the poor. Give examples of how tech has benefited those who likely would not have been able to afford the technology of a prior generation. How have cheaper, faster chips impacted the camera industry? Give an example of the leadership shifts that have occurred in this industry. What has been the impact of “faster, cheaper” on Apple’s business lines? How did Amazon utilize the steep decline in magnetic storage costs to its advantage? How does Moore’s Law impact production and inventory decisions? 4.2 The Death of Moore’s Law? Describe why Moore’s Law continues to advance, and discuss the physical limitations of this advancement. Name and describe various technologies that may extend the life of Moore’s Law. Discuss the limitations of each of these approaches. Moore simply observed that we’re getting better over time at squeezing more stuff into tinier spaces. Moore’s Law is possible because the distance between the pathways inside silicon chips gets smaller with each successive generation. While chip plants (semiconductor fabrication facilities, or fabsSemiconductor fabrication facilities; the multibillion dollar plants used to manufacture semiconductors.) are incredibly expensive to build, each new generation of fabs can crank out more chips per silicon wafer. And since the pathways are closer together, electrons travel shorter distances. If electronics now travel half the distance to make a calculation, that means the chip is twice as fast. But the shrinking can’t go on forever, and we’re already starting to see three interrelated forces—size, heat, and power—threatening to slow down the Moore’s Law gravy train. When you make processors smaller, the more tightly packed electrons will heat up a chip—so much so that unless today’s most powerful chips are cooled down, they will melt inside their packaging. To keep the fastest computers cool, most PCs, laptops, and video game consoles need fans, and most corporate data centers have elaborate and expensive air conditioning and venting systems to prevent a meltdown. A trip through the Facebook data center during its recent rise would show that the firm was a “hot” startup in more ways than one. The firm’s servers ran so hot that the Plexiglass sides of the firm’s server racks were warped and melting!E. McGirt, “Hacker, Dropout, C.E.O.,” Fast Company, May 2007. The need to cool modern data centers draws a lot of power and that costs a lot of money. The chief eco officer at Sun Microsystems has claimed that computers draw four to five percent of the world’s power. Google’s chief technology officer has said that the firm spends more to power its servers than the cost of the servers themselves.D. Kirkpatrick, “The Greenest Computer Company under the Sun,” April 13, 2007. Microsoft, Yahoo! and Google have all built massive data centers in the Pacific Northwest, away from their corporate headquarters, specifically choosing these locations for access to cheap hydroelectric power. Google’s location in The Dalles, Oregon, is charged a cost per kilowatt hour of two cents by the local power provider, less than one-fifth of the eleven-cent rate the firm pays in Silicon Valley.S. Mehta, “Behold the Server Farm,” Fortune, August 1, 2006. Also see Chapter 10 "Software in Flux: Partly Cloudy and Sometimes Free" in this book. This difference means big savings for a firm that runs more than a million servers. And while these powerful shrinking chips are getting hotter and more costly to cool, it’s also important to realize that chips can’t get smaller forever. At some point Moore’s Law will run into the unyielding laws of nature. While we’re not certain where these limits are, chip pathways certainly can’t be shorter than a single molecule, and the actual physical limit is likely larger than that. Get too small and a phenomenon known as quantum tunneling kicks in, and electrons start to slide off their paths. Yikes! One way to overcome this problem is with multicore microprocessorsMicroprocessors with two or more (typically lower power) calculating processor cores on the same piece of silicon, made by putting two or more lower power processor cores (think of a core as the calculating part of a microprocessor) on a single chip. Philip Emma, IBM’s Manager of Systems Technology and Microarchitecture, offers an analogy. Think of the traditional fast, hot, single-core processors as a three hundred-pound lineman, and a dual-core processor as two 160-pound guys. Says Emma, “A 300-pound lineman can generate a lot of power, but two 160-pound guys can do the same work with less overall effort.”Adam Ashton, “More Life for Moore’s Law,” BusinessWeek, June 20, 2005. For many applications, the multicore chips will outperform a single speedy chip, while running cooler and drawing less power. Multicore processors are now mainstream. By 2007, most PCs and laptops sold had at least a two-core (dual-core) processor. The Microsoft XBox 360 has three cores. The PlayStation 3 includes the so-called cell processor developed by Sony, IBM, and Toshiba that runs nine cores. By 2008, quad-core processors were common in high-end desktops and low-end servers. By 2010, AMD plans a 12-core PC chip. Intel has even demonstrated chips with upward of 48 cores. Multicore processors can run older software written for single-brain chips. But they usually do this by using only one core at a time. To reuse the metaphor above, this is like having one of our 160-pound workers lift away, while the other one stands around watching. Multicore operating systems can help achieve some performance gains. Versions of Windows or the Mac OS that are aware of multicore processors can assign one program to run on one core, while a second application is assigned to the next core. But, in order to take full advantage of multicore chips, applications need to be rewritten to split up tasks so that smaller portions of a problem are executed simultaneously inside each core. Writing code for this “divide and conquer” approach is not trivial. In fact, developing software for multicore systems is described by Shahrokh Daijavad, software lead for next-generation computing systems at IBM, as “one of the hardest things you learn in computer science.”Adam Ashton, “More Life for Moore’s Law,” BusinessWeek, June 20, 2005. Microsoft’s chief research and strategy officer has called coding for these chips “the most conceptually different [change] in the history of modern computing.”M. Copeland, “A Chip Too Far?” Fortune, September 1, 2008. Despite this challenge, some of the most aggressive adaptors of multicore chips have been video game console manufacturers. Video game applications are particularly well-suited for multiple cores since, for example, one core might be used to render the background, another to draw objects, another for the “physics engine” that moves the objects around, and yet another to handle Internet communications for multiplayer games. Another approach to breathing life into Moore’s Law is referred to as stacked or three-dimensional semiconductorsSemiconductors that are manufactured as a stack of multiple, interconnected layers instead of in one flat plane.. In this approach, engineers slice a flat chip into pieces, then reconnect the pieces vertically, making a sort of “silicon sandwich.” The chips are both faster and cooler since electrons travel shorter distances. What was once an end-to-end trip on a conventional chip might just be a tiny movement up or down on a stacked chip. But stacked chips present their own challenges. In the same way that a skyscraper is more difficult and costly to design and build than a ranch house, 3D semiconductors are tougher to design and manufacture. IBM has developed stacked chips for mobile phones, claiming the technique improves power efficiency by up to 40 percent. Quantum Leaps, Chicken Feathers, and the Indium Gallium Arsenide Valley? Think about it—the triple threat of size, heat, and power means that Moore’s Law, perhaps the greatest economic gravy train in history, will likely come to a grinding halt in your lifetime. Mutlicore and 3D semiconductors are here today, but what else is happening to help stave off the death of Moore’s Law? Every once in a while a material breakthrough comes along that improves chip performance. A few years back researchers discovered that replacing a chip’s aluminum components with copper could increase speeds up to 30 percent. Now scientists are concentrating on improving the very semiconductor material that chips are made of. While the silicon used in chips is wonderfully abundant (it has pretty much the same chemistry found in sand), researchers are investigating other materials that might allow for chips with even tighter component densities. Researchers have demonstrated that chips made with supergeeky-sounding semiconductor materials such as indium gallium arsenide, indium aluminum arsenide, germanium, and bismuth telluride can run faster and require less wattage than their silicon counterparts.Y. L. Chen, J. G. Analytis, J.-H. Chu, Z. K. Liu, S.-K. Mo, X. L. Qi, H. J. Zhang, et al., “Experimental Realization of a Three-Dimensional Topological Insulator, Bi2Te3,” Science 325, no. 5937 (July 10, 2009): 178–81; Kate Greene, “Intel Looks Beyond Silicon,” Technology Review, December 11, 2007; and A. Cane, “A Valley By Any Other Name…” Financial Times, December 11, 2006. Perhaps even more exotic (and downright bizarre), researchers at the University of Delaware have experimented with a faster-than-silicon material derived from chicken feathers! Hyperefficient chips of the future may also be made out of carbon nanotubes, once the technology to assemble the tiny structures becomes commercially viable. Other designs move away from electricity over silicon. Optical computing, where signals are sent via light rather than electricity, promises to be faster than conventional chips, if lasers can be mass produced in miniature (silicon laser experiments show promise). Others are experimenting by crafting computing components using biological material (think a DNA-based storage device). One yet-to-be-proven technology that could blow the lid off what’s possible today is quantum computing. Conventional computing stores data as a combination of bits, where a bit is either a one or a zero. Quantum computers, leveraging principles of quantum physics, employ qubits that can be both one and zero at the same time. Add a bit to a conventional computer’s memory and you double its capacity. Add a bit to a quantum computer and its capacity increases exponentially. For comparison, consider that a computer model of serotonin, a molecule vital to regulating the human central nervous system, would require 1094 bytes of information. Unfortunately there’s not enough matter in the universe to build a computer that big. But modeling a serotonin molecule using quantum computing would take just 424 qubits.Paul Kaihla, “Quantum Leap,” Business 2.0, August 1, 2004. Some speculate that quantum computers could one day allow pharmaceutical companies to create hyperdetailed representations of the human body that reveal drug side effects before they’re even tested on humans. Quantum computing might also accurately predict the weather months in advance or offer unbreakable computer security. Ever have trouble placing a name with a face? A quantum computer linked to a camera (in your sunglasses, for example) could recognize the faces of anyone you’ve met and give you a heads up to their name and background.Peter Schwartz, Chris Taylor, and Rita Koselka, “The Future of Computing: Quantum Leap,” Fortune, August 2, 2006. Opportunities abound. Of course, before quantum computing can be commercialized, researchers need to harness the freaky properties of quantum physics wherein your answer may reside in another universe, or could disappear if observed (Einstein himself referred to certain behaviors in quantum physics as “spooky action at a distance”). Pioneers in quantum computing include IBM, HP, NEC, and a Canadian startup named D-Wave. At a 2007 at the Computer History Museum in Mountain View, California, D-Wave demonstrated Orion, a sixteen-qubit computer that could find a protein in a database, figure out the optimal wedding guest seating arrangements, and solve a Sudoku puzzle. Scientific opinion varied widely as to the significance of the D-Wave advance. The Orion was built using a chip cooled to minus 273 degrees Celsius in a bath of liquid helium and tasks were performed at speeds about 100 times slower than conventional PCs. Not exactly commercial stuff. But it was the most advanced quantum computing demonstration to date. If or when quantum computing becomes a reality is still unknown, but the promise exists that while Moore’s Law may run into limits imposed by Mother Nature, a new way of computing may blow past anything we can do with silicon, continuing to make possible the once impossible. As chips get smaller and more powerful, they get hotter and present power-management challenges. And at some point Moore’s Law will stop because we will not longer be able to shrink the spaces between components on a chip. Multicore chips use two or more low-power calculating “cores” to work together in unison, but to take optimal advantage of multicore chips, software must be rewritten to “divide” a task among multiple cores. 3D or Stackable semiconductors can make chips faster and run cooler by shortening distances between components, but these chips are harder to design and manufacture. New materials may extend the life of Moore’s Law, allowing chips to get smaller, still. Entirely new methods for calculating, such as quantum computing, may also dramatically increase computing capabilities far beyond what is available today. What three interrelated forces threaten to slow the advancement of Moore’s Law? Which commercial solutions, described in the section above, are currently being used to counteract the forces mentioned above? How do these solutions work? What are the limitations of each? Will multicore chips run software designed for single-core processors? As chips grow smaller they generate increasing amounts of heat that needs to be dissipated. Why is keeping systems cool such a challenge? What are the implications for a firm like Google or Yahoo!? For a firm like Apple or Dell? What are some of the materials that may replace the silicon that current chips are made of? What kinds of problems might be solved if the promise of quantum computing is achieved? How might individuals and organizations leverage quantum computing? What sorts of challenges could arise from the widespread availability of such powerful computing technology? Give examples of the business use of supercomputing and grid computing. Describe grid computing and discuss how grids transform the economics of supercomputing. Understand the characteristics of problems that are and are not well suited for supercomputing and grid computing. As Moore’s Law makes possible the once impossible, businesses have begun to demand access to the world’s most powerful computing technology. SupercomputersComputers that are among the fastest of any in the world at the time of their introduction. are computers that are among the fastest of any in the world at the time of their introduction.A list of the current supercomputer performance champs can be found at http://www.top500.org. Supercomputing was once the domain of governments and high-end research labs, performing tasks such as simulating the explosion of nuclear devices, or analyzing large-scale weather and climate phenomena. But it turns out with a bit of tweaking, the algorithms used in this work are profoundly useful to business. Consider perhaps the world’s most well-known supercomputer, IBM’s Deep Blue, the machine that rather controversially beat chess champion Gary Kasparov. While there is not a burning need for chess-playing computers in the world’s corporations, it turns out that the computing algorithms to choose the best among multiple chess moves are similar to the math behind choosing the best combination of airline flights. One of the first customers of Deep Blue technologies was United Airlines, which gained an ability to examine three hundred and fifty thousand flight path combinations for its scheduling systems—a figure well ahead of the previous limit of three thousand. Estimated savings through better yield management? Over fifty million dollars! Finance found uses, too. An early adopter was CIBC (the Canadian Imperial Bank of Commerce), one of the largest banks in North America. Each morning CIBC uses a supercomputer to run its portfolio through Monte Carlo simulations that aren’t all that different from the math used to simulate nuclear explosions. An early adopter of the technology, at the time of deployment, CIBC was the only bank that international regulators allowed to calculate its own capital needs rather than use boilerplate ratios. That cut capital on hand by hundreds of millions of dollars, a substantial percentage of the bank’s capital, saving millions a year in funding costs. Also noteworthy: the supercomputer-enabled, risk-savvy CIBC was relatively unscathed by the sub-prime crisis. Modern supercomputing is typically done via a technique called massively parallelComputers designed with many microprocessors that work together, simultaneously, to solve problems. processing (computers designed with many microprocessors that work together, simultaneously, to solve problems). The fastest of these supercomputers are built using hundreds of microprocessors, all programmed to work in unison as one big brain. While supercomputers use special electronics and software to handle the massive load, the processors themselves are often of the off-the-shelf variety that you’d find in a typical PC. Virginia Tech created what at the time was the world’s third-fastest supercomputer by using chips from 1,100 Macintosh computers lashed together with off-the-shelf networking components. The total cost of the system was just $5.2 million, far less than the typical cost for such burly hardware. The Air Force recently issued a request-for-proposal to purchase 2,200 PlayStation 3 systems in hopes of crafting a supercheap, superpowerful machine using off-the-shelf parts. Another technology, known as grid computingA type of computing that uses special software to enable several computers to work together on a common problem as if they were a massively parallel supercomputer., is further transforming the economics of supercomputing. With grid computing, firms place special software on its existing PCs or servers that enables these computers to work together on a common problem. Large organizations may have thousands of PCs, but they’re not necessarily being used all the time, or at full capacity. With grid software installed on them, these idle devices can be marshaled to attack portions of a complex task as if they collectively were one massively parallel supercomputer. This technique radically changes the economics of high-performance computing. BusinessWeek reports that while a middle-of-the-road supercomputer could run as much as thirty million dollars, grid computing software and services to perform comparable tasks can cost as little as twenty-five thousand dollars, assuming an organization already has PCs and servers in place. An early pioneer in grid computing is the biotech firm Monsanto. Monsanto enlists computers to explore ways to manipulate genes to create crop strains that are resistant to cold, drought, bugs, pesticides, or that are more nutritious. Previously with even the largest computer Monsanto had in-house, gene analysis was taking six weeks and the firm was able to analyze only ten to fifty genes a year. But by leveraging grid computing, Monsanto has reduced gene analysis to less than a day. The fiftyfold time savings now lets the firm consider thousands of genetic combinations in a year.Peter Schwartz, Chris Taylor, and Rita Koselka, “The Future of Computing: Quantum Leap,” Fortune, August 2, 2006. Lower R&D time means faster time to market—critical to both the firm and its customers. Grids are now everywhere. Movie studios use them to create special effects and animated films. Proctor & Gamble has used grids to redesign the manufacturing process for Pringles potato chips. GM and Ford use grids to simulate crash tests, saving millions in junked cars and speeding time to market. Pratt and Whitney test aircraft engine designs on a grid. And biotech firms including Aventis, GlaxoSmithKlein, and Pfizer push their research through a quicker pipeline by harnessing grid power. JP Morgan Chase even launched a grid effort that mimics CIBC’s supercomputer, but at a fraction of the latter’s cost. By the second year of operation, the JPMorgan Chase grid was saving the firm five million dollars per year. Massive clusters of computers running software that allows them to operate as a unified service also enable new service-based computing models, such as software as a service (SaaS)A form of cloud computing where a firm subscribes to a third-party software and receives a service that is delivered online. and cloud computingReplacing computing resources—either an organization’s or individual’s hardware or software—with services provided over the Internet.. In these models, organizations replace traditional software and hardware that they would run in-house with services that are delivered online. Google, Microsoft, SalesForce.com, and Amazon are among the firms that have sunk billions into these Moore’s Law–enabled server farmsA massive network of computer servers running software to coordinate their collective use. Server farms provide the infrastructure backbone to SaaS and hardware cloud efforts, as well as many large-scale Internet services., creating entirely new businesses that promise to radically redraw the software and hardware landscape while bringing the gargantuan computing power to the little guy (see Chapter 10 "Software in Flux: Partly Cloudy and Sometimes Free"). You can join a grid, too. SETI@Home turns your computer screen saver into a method to help “search for extraterrestrial intelligence,” analyzing data from the Arecibo radio telescope system in Puerto Rico (no E.T. spotted yet). FightAids@Home will enlist your PC to explore AIDS treatments. And Folding@Home is an effort by Stanford researchers to understanding the science of protein-folding within diseases such as Alzheimer’s, cancer, and cystic fibrosis. A version of Folding@Home software for the PlayStation 3 had enlisted over half a million consoles within months of release. Having access to these free resources is an enormous advantage for researchers. Says the director of Folding@Home, “Even if we were given all of the NSF supercomputing centers combined for a couple of months, that is still fewer resources than we have now.”G. Johnson, “Supercomputing ‘@Home’ Is Paying Off,” New York Times, April 23, 2002. Multicore, massively parallel, and grid computing are all related in that each attempts to lash together multiple computing devices so that they can work together to solve problems. Think of multicore chips as having several processors in a single chip. Think of massively parallel supercomputers as having several chips in one computer, and think of grid computing as using existing computers to work together on a single task (essentially a computer made up of multiple computers). While these technologies offer great promise, they’re all subject to the same limitation: software must be written to divide existing problems into smaller pieces that can be handled by each core, processor, or computer, respectively. Some problems, such as simulations, are easy to split up, but for problems that are linear (where, say, step two can’t be completed until the results from step one are known), the multiple-brain approach doesn’t offer much help. Most modern supercomputers use massive sets of microprocessors working in parallel. The microprocessors used in most modern supercomputers are often the same commodity chips that can be found in conventional PCs and servers. Moore’s Law means that businesses as diverse as financial services firms, industrial manufacturers, consumer goods firms, and film studios can now afford access to supercomputers. Grid computing software uses existing computer hardware to work together and mimic a massively parallel supercomputer. Using existing hardware for a grid can save a firm the millions of dollars it might otherwise cost to buy a conventional supercomputer, further bringing massive computing capabilities to organizations that would otherwise never benefit from this kind of power. Massively parallel computing also enables the vast server farms that power online businesses like Google and Facebook, and which create new computing models, like software as a service (SaaS) and cloud computing. The characteristics of problems best suited for solving via multicore systems, parallel supercomputers, or grid computers are those that can be divided up so that multiple calculating components can simultaneously work on a portion of the problem. Problems that are linear—where one part must be solved before moving to the next and the next—may have difficulty benefiting from these kinds of “divide and conquer” computing. Fortunately many problems such as financial risk modeling, animation, manufacturing simulation, and gene analysis are all suited for parallel systems. What is the difference between supercomputing and grid computing? How is each phenomenon empowered by Moore’s Law? How does grid computing change the economics of supercomputing? Which businesses are using supercomputing and grid computing? Describe these uses and the advantages they offer their adopting firms. Are they a source of competitive advantage? Why or why not? What are the characteristics of problems that are most easily solved using the types of parallel computing found in grids and modern day supercomputers? What are the characteristics of the sorts of problems not well suited for this type of computing? “Big Ben” has won two Super Bowls with the Pittsburgh Steelers. “Big Ben” is also a Cray XT3 supercomputer located at the Pittsburgh Supercomputing Center (PSC). Visit the PSC Web site (http://www.psc.edu) and type “big ben” in the search window. How many processors does “Big Ben” have? How many cores per processor? What is the advantage of using grid computing to simulate an automobile crash test as opposed to actually staging a crash?